I’ve been asked to give a talk about the special sauce of what I do in the climate equity and resilience space. It won’t come with a recipe, but you’ll be presented with organic and sustainable ingredients I hope you’ll find nourishing. I’m an advocate about things I passionately care about. I’m passionate about words. Because they not only mean something, they also do something. I believe that words have tremendous power. They have the power to heal. They also have the power to hurt and harm. As a trusted voice in the policy and community arenas, health care has the power to significantly impact the trajectory of climate change. I want to share with you my story about how I came into health care, and how necessary health care is to the larger climate narrative — in that we have a story to tell and the way we come to tell our story matters a whole lot. And our story will be enough. Each and every one of your voices matter. The endeavor to change the course of health care will be impossible, if not incomplete, without your climate story. While others can shape your story, you and only you, can tell it from the first person perspective. It begins with seeing your child-self in the words. My climate story starts with a confession. I am an unexpected advocate. Everything seemingly about my DNA and what others expected of me was that I become a nurse. Becoming a nun was also a very real possibility. Picture this: I’m in a tiny confessional, sitting across from Father Joe, staring at him through an open window. I’m thinking this is the moment I’m going to let him know I hear the call and want to make the ultimate sacrifice — myself in service of others. Father Joe told me to go off to college while I continued discerning. If he hadn’t done that, my story could be very different. I went to Berkeley, and many moons later, here I am with you. Those were my options: nurse or nun. To be otherwise, someone — I, had to figure it out and set my own path. When I was a child, I don’t ever recall waking up saying, “When I grow up, I’m going to be a health care advocate.” In looking back, my child-self was always pulling for me to be me. But who is that? A question, no doubt, Narcissus didn’t know how to quite answer. One has to admire Caravaggio’s mastery. 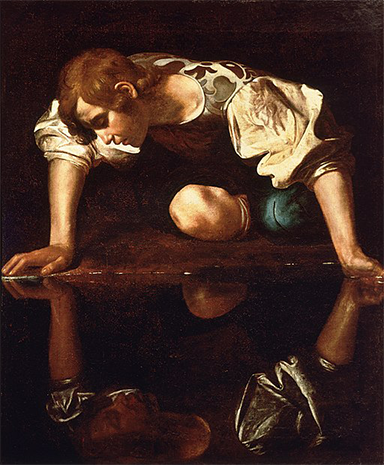 Narcissus, captured intensely in light, is the central figure in this painting, but so too is the pool of water, radiant in darkness, an essential element. Man and nature, light and dark — distinct from one another, yet locked in circle. This painting shows how in the face of nature, you’re able to see who you are. Nature does not discriminate. It has no qualms holding up a mirror to show you your reflection. We must not only see ourselves in nature, but equally so, we must see ourselves of nature. I began by saying health care has a story to tell. Who are you in the communities you serve? How are you showing up as a healing mission of the communities you serve? As an anchor institution, what story would you tell about how you’re advancing climate-smart health care? The tragedy of Narcissus is not that he saw a beautiful reflection on the surface of the pool, but that he didn’t recognize that what he was seeing was only an image of himself. Perhaps if he knew the distinction, he would have marveled at nature’s reflective properties instead of falling for himself. This unrequited love, as you know, was his downfall. A changing climate will not be Earth’s demise. I submit the tragic story will be the fall of humanity, in the inability to see our nature, ourselves in relationship with the environment that is ours to steward. We need to champion a narrative that says: We’re here, showing up, doing our part. But for us to make a difference, our voice has to be authentic, fierce, courageous, curious, compassionate, and in awe of what could be accomplished, while humble still knowing we can’t do it alone. I wake up to this picture every day. It’s not a Caravaggio, but it will do. I’m fascinated by the figures. It’s a wonder to me, even half a century later, who that baby is and how she got her voice. I visit with Dad often these days. He suffered a hemorrhagic stroke a few months ago. He shows me the resilience of mind, body, and spirit — how at the fullness of age you can turn your life around, get back up on your feet truer to who you are, and say the words that finally need to be said. This photo reminds me that in the face of others, you’re able to build your story. So I ask who is that little girl? I have very few memories of me as a child in the Philippines, so I’ve engaged Dad in storytelling. 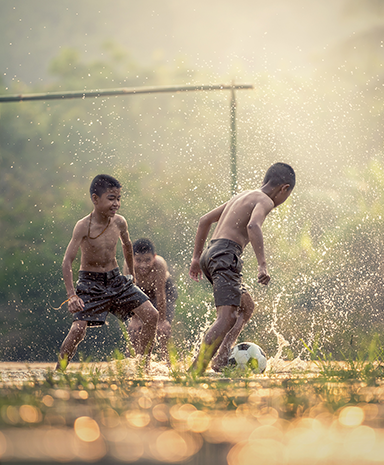 He tells me that I loved to play, sing…and fetch water at a nearby public pump. You see, we lived in a rural province, where I was born in the kitchen of my grandparents’ house. Many would say we were poor. But I remember being happy, that there were others who were not less, but had less, were hungrier, needed a place to sleep. We were there for each other. My claim to fame as a 4-year-old child was that I was picked to be a little reina (queen) for some kind of religious town parade honoring the Virgin Mary. I remember the procession as if it’s happening now: I’m carrying a bouquet, walking for what seems like an eternity. There’s an older boy beside me, holding a lit candle in devotion. Top on my mind is: Blessed Mother, how on Earth am I going to keep my oversized underwear from falling down around my ankles? I’m wearing a long dress. I’m thinking I can take tinier steps. Oh, but heavens, tripping would be a disaster, the death of me. Everything is going to be ok. I can do this. Child-self never abandons. It is always trying to make sure everything is going to be ok. The complexity and richness of your story includes all of it — the past, fears, aspirations, people and places, facts and data, the sky and oversized underwear falling, the challenges still. Your narrative may not always come so easily or easily tied together. That’s OK. Sometimes it requires patience, discernment, reaching out to others, finding new combinations of words. What’s a perfect story anyway? If Narcissus could speak, he’d warn us: Don’t fall for the false narrative. Don’t ever forget your audacious kid wonder child-self (StockVault). I have seen how the health care story can be so powerful. Please know that your story is worth telling. Don’t ever forget that your child-self is that audacious kid wonder, ever-present narrator, meaning-maker of a larger story that continues to unfold. Discover trusting your voice. ’Til this day, I admit I experience this impish sense of being in the public’s eye. 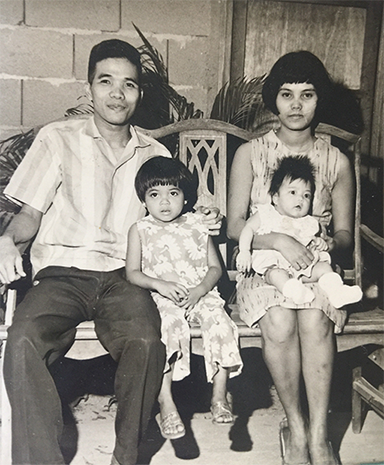 I sometimes have to push myself to be me, break through others’ single story of me — as Filipina, as the poor child, as the indebted immigrant, as someone less than who I am in the face of a dominant narrative. You and I see what’s on the surface of the pool — what’s going on with health care right now. Why not shatter the single story with multiple narratives about who we really are and what we’re up to? I can tell you: Your story will be enough — in that it is true. There is no denying, we are locked in circle with the world. Yes, the landscape and tenor are different today. But there are opportunities at every turn to be bolder, braver, do all we can to keep the promise. We are the expected advocates. 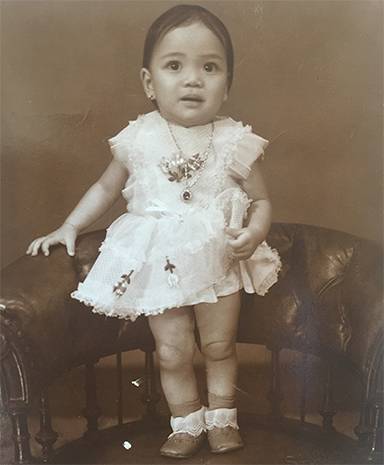 Who would have thought that I would become this Wonder(ing) Woman that my adopted country encouraged me to dream I could be — using my voice and super powers for health care and Earth? I would be remiss if I didn’t give a shout out to the nurses and Sisters around the globe. I’ve been a big fan of your work as long as I can remember. 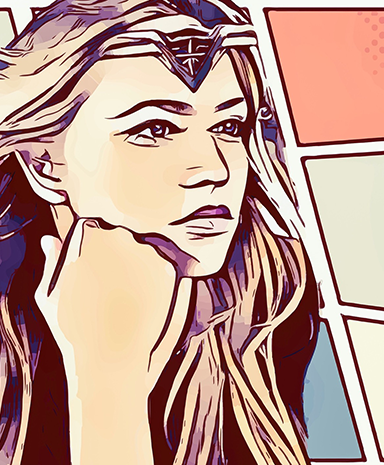 The world needs every day heroines and heroes, our brand of Justice Seekers. Health care needs you — the many, diverse voices to connect the dots between climate and health. Tell your story with policymakers, with your leadership teams and staff, community and business colleagues, neighbors and family. Let’s practice with each other. Why not do more to put a spotlight on the initiatives we’re undertaking to reduce our greenhouse gas emissions and what part we’re playing to advance a clean energy, low-carbon future? Let’s show how sustainability is the bottom line and how that’s synonymous to what it means to be a healing mission in 21st century Earth. Let’s talk openly and honestly about next steps. Bring your child-self along for the journey — that feisty, playful part of yourself that perseveres, who may not always know what the future holds, but holds the future in the palm of your hands knowing we can navigate the course of change together. I believe that when we each are giving voice to build the health care climate story, it will be enough to move transformation forward, sustain our healing mission, bring humankindness and joy to Earth, and enliven narratives of hope and love. Rachelle Reyes Wenger, M.P.A., is the director of public policy and community advocacy for Dignity Health. Headquartered in San Francisco, Dignity Health is one of the largest, private, not-for-profit health care systems in in the nation. Its mission is to deliver compassionate, high-quality, affordable health care services with special attention to people who are poor, vulnerable, and underserved. 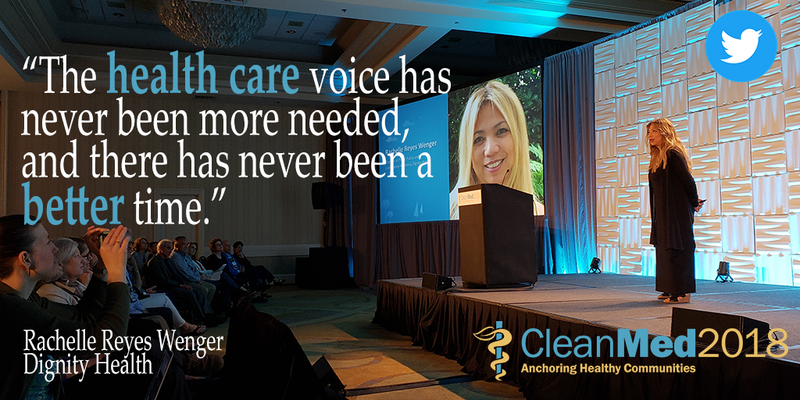 Check out the CleanMed website to learn more about Rachelle and CleanMed.